It was already late in the afternoon when we reached the Marcos Museum in Batac, Ilocos Norte. The burial chamber of former President Ferdinand Marcos was still closed when we arrived so we waited for the caretaker to come back. We went around the museum and the mansion and checked out the memorabilia of the late President. When the chamber was finally opened I opted to stay outside. I've seen him three times already and I knew that there's nothing new to see inside. 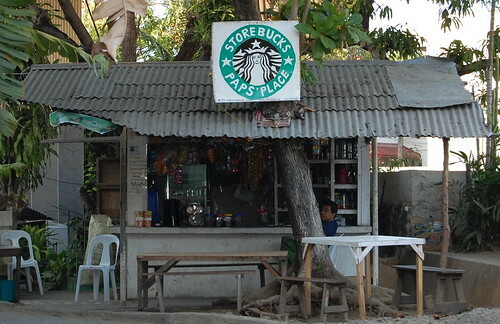 I chanced upon a small store in the compound and at first I thought that there's a Starbucks shop there but it turned out that the sign read Storebucks! I knew that I have to take a picture of it for posterity. Afterwards, we bought some goods and I got some Sweet Potato (kamote) Chips. I liked it so I decided to buy a few packs for my officemates. 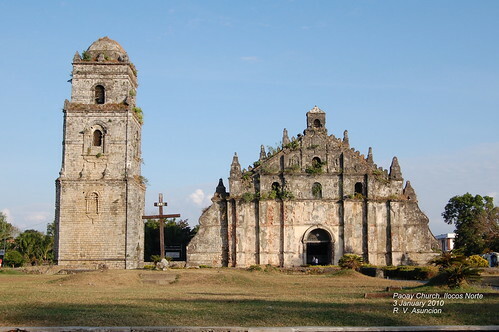 Our next stop was the UNESCO World Heritage site, the Paoay Church also known as the St. Augustine Church. No matter howw many times I've been there, I continue to find it so beautiful. It was built in the 18th century out of coralstones that were locally available. The architecture reminds me of other Asian temples too. I stayed outside as family members went inside and checked out the interiors of the church. We drove to the Fort Ilocandia Resort afterwards and also passed by the Paoay Lake and got a glimpse of the Malacanang of the North. 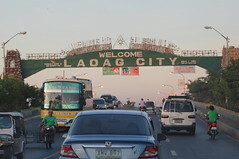 From here, we went directly to Laoag where we had our dinner. We took advantage of the city's new mall to buy other supplies we needed before proceeding to Pagudpud which was still two hours away.